A reviewer once called Peter Viereck's thought "not common sense but inspired, electric common sense." This volume of Viereck's selected essays on poetry and on history, written between 1938 through 2004, exemplifies this quality. Its main theme is suggested in Viereck's coined phrase "strict wildness," which suggests a balance between restraint (which by itself is staid and rigid) and passion (which by itself is incoherent). Frost called free verse tennis without the net. Viereck calls dead mechanical form "net without the tennis." 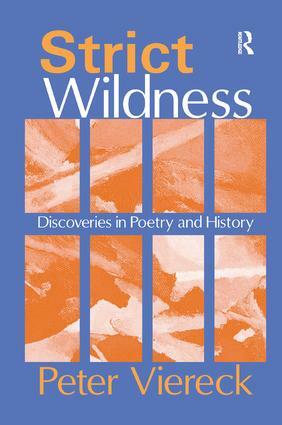 Strict wildness, then, is spontaneity of feeling within strict organic form.The book explores questions of modernism and poetic craft with respect to American poetry. It discusses the controversy over Ezra Pound's politics and its relation to his poetics, as well as the nearly forgotten poet Vachel Lindsay. Viereck offers more general views on poetics, including the fruitful tensions between form and content, and the impact of modern technology on poetic expression. He also discusses history and politics, and contains essays on McCarthyism, the Cold War, political conformity of the Left and Right, and discusses issues of historiography and culture that define Viereck's highly individual, often critical brand of conservatism. In treating representative trends and figures in conservative thought, Viereck insists on clear awareness of what exists to conserve, what ought to be conserved, and why it should be conserved.In their range and originality, the writings brought together in Strict Wildness constitute an ideal introduction to Peter Viereck's literary and political thought and how they come together. It will be of interest to literary scholars, intellectual historians, and social scientists. The introduction allows the reader to grasp a clear sense of the context and background of Viereck's works. Strict Form in Poetry: Would Jacob Wrestle with a Flabby Angel?